This photo of the original Karl von Pressentin ranch house was taken on May 15, 1921, a few years before it burned. Photo courtesy of Barbara Halliday, a descendant of the von Pressentin and Kemmerich families, who has provided volumes of information and photos for this section. We were privileged to attend the annual reunion of the von Pressentin family in 2001. As of the winter of 2011-12, the 16 stories linked below are part of a series on the German-immigrant family who moved here from Michigan, Wisconsin and Ohio, starting in 1877. The family dates back to at least 1270 in the town of Prestin near Berlin. The Karl von Pressentin family homesteaded on the south side of the Skagit across from Birdsview and Karl Americanized his name to Charles. Some family members have kept the baronial "von" in the surname, but most have not, especially in ensuing generations. We have always been fascinated by Skagit Bill Pressentin, who was a favorite of hunters and mountain men of the Skagit, and his wife Rona, who lived to be 100; and the A.V. Pressentin family of Sauk and Rockport. And Otto von Pressentin left quite a mark on the local area as one of the adherents of the outdoor life and how to survive in the wilderness. The von Pressentins are the most-featured family in the Journal, due to their dominance in many towns upriver. We are moving all our original "stumpranchonline.com" features, like many of these below, to our new domain. If the main link does not work, click on the alternate new address. If neither file connects, please email us and we will correct the link and send one to you that works. Thank you. A library of additional articles about the Karl and Minnie Pressentin family. The story of Karl and Minnie von Pressentin, and their family of strapping frontier boys. From Kemmerich and von Pressentin descendant Barbara Halliday. new address. Interviews with Paul Pressentin, updated from our old website, about the von Pressentin family, their arrival and life on the Birdsview homestead. Maurice Heitand's 1949 Mount Vernon Daily Herald story of when the Karl von Pressentin family arrived at Birdsview in 1878 from Manistee, Michigan, after stopping in Seattle. Includes description of very early Mount Vernon the year it began and a 1929 biography of Paul Pressentin. new address. A 1949 Mount Vernon Daily Herald interview with Paul Pressentin about Karl Pressentin, his family and his role in the group that crossed the Cascade pass in 1877 in search of gold. new address. John B. Neal's 1957 Skagit Valley Herald story of A.v. Pressentin's family of Sauk and Rockport, including sons Ed and Bert and the memories of his nephew Paul Pressentin. Includes the story of the sternwheeler captain who used slabs of bacon for fuel during a race on the Skagit River. new address. Charlotte D. Widrig's 1961 Seattle Times interview with Paul Pressentin about his family's life on their Birdsview homestead and his mother's role as a pioneer wife and widow. new address. 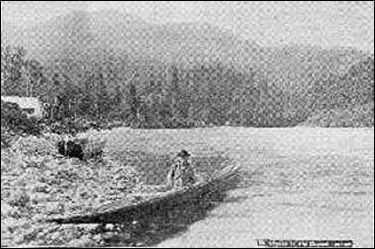 This photo of an Indian canoe near Marblemount was taken by Darius Kinsey of Sedro-Woolley and appeared in Sebring's Illustrated magazine in 1902. See the story about Otto Pressentin and how he reacted to the 1897 Skagit River flood when he was a schoolteacher in Marblemount. Back in about 1932 I was hiking up to cross the Cascade Pass and I was standing here by the river about where we are now [near Rockport] and all of a sudden I heard a really loud splash in the water, but I couldn't see anything clear on that overcast day. I wondered if it was one of those really large sturgeons we saw now and then. But pretty soon I saw a man stand up in the water and stride towards the shore. It was Otto Pressentin. After congratulating him, I asked him why he did it? He explained that he wanted to go to Marblemount and he was working a ways east of their home and the Pressentin Ferry Landing, so he just decided to dive in and swim over here instead. And that was not the only time he did it. One of the strongest men I've ever seen. —Howard Miller, 1998 interview. Yup I knew Otto Von, he was one powerful guy and ran the ferry across the river (from their ranch to the north shore). We forestry critters would watch in amazement as Otto cranked that big old cable wheel with one hand. He really had a fit when the army tried to run a tank retriever onto his ferry and the ferry did a glub, glub and sank. —Dr. Quentin C. Belles correspondence, Sedro-Woolley High School alumnus. 1958 article by Ray Jordan about Otto's early years in British Columbia as a fur trader, starting in 1911, and his initial trade with Indians who lived in the interior. The only man we know of who walked back and forth to Alaska. Twice, circa 1910. This story will soon be changed to this address. If neither file connects, please email us. Otto K. Pressentin, Fur Trading, Part Two, another story by Ray Jordan that includes prices for goods and furs and details about Otto's later years in the province through 1921. This story will soon be changed to this address. If neither file connects, please email us. In 1958, Otto Pressentin recalled the 1897 Skagit River flood that wiped out several downriver towns and how he helped save the books and bell from the Marblemount School where he was teaching. Skagit Bill and Rona Pressentin, pioneers of Rockport, often called "salt of the earth. This story will soon be changed to this address. If neither file connects, please email us. Chuck Pressentin's 1961 memories of his grandfather's California flood experiences before moving to Washington territory, and his earliest days here on the Skagit river near Birdsview. This story will soon be changed to this address. If neither file connects, please email us. Obituary of Minnie von Pressentin, 1945, wife of 1877 Birdsview pioneer Karl von Pressentin. This story will soon be changed to this address. If neither file connects, please email us. Profiles of Ed V. Pressentin, Rockport pioneer and merchant. This story will soon be changed to this address. If neither file connects, please email us. Part 2: Obituaries and other articles about Ed V. Pressentin, Updated from Issue 31: and his father, A.V. Pressentin, Karl's younger brother. Includes a brief recap of the von Pressentins in Germany and in the U.S. This story has been re-posted with a newspaper story from 1907. This story will soon be changed to this address. If neither file connects, please email us. Tom Benton's 1965 history of Rockport and the role that his von Pressentin ancestors played in its birth. All stories in the Upriver Section of the Journal, in the region from Utopia near Minkler Lake, all the way east to the North Cascades mountain range, sorted by town. The Rockport Hotel burns in 1952; includes a history of its owners and role in Rockport, including the builder, A.v. Pressentin, Hugo Bauman and Will D. Bob Jenkins. This story will soon be changed to this address. If neither file connects, please email us. The story of Bessie Porter's memories of upper Skagit river history, including the von Pressentin family. The story of Klement party crosses Cascade Pass in the 1870s with Karl von Pressentin and others. This story will soon be changed to this address. If neither file connects, please email us. The story of old Sauk City on the south shore of the Skagit River and the first business of A.v. Pressention. 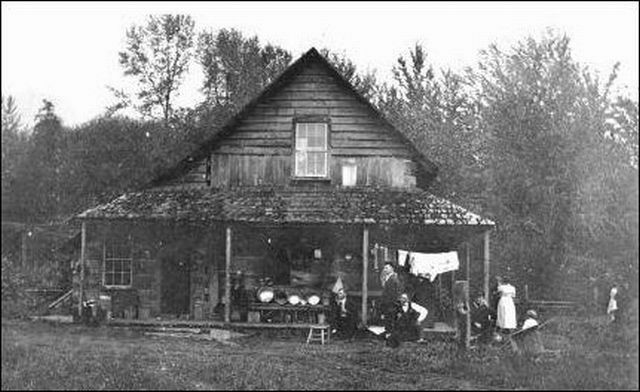 See Barbara Halliday's fine website with genealogy and photos of her Kemmerich and von Pressentin ancestors and their homesteads in Birdsview, north and south of the Skagit River. Two interviews with Fred Martin, son of Henry and a state senator and administrator, one from 1979 in the Concrete Herald and another from 1959 in the Puget Sound Mail, which featured his remarks at the annual Historical Society picnic. How upriver Skagit Catholics organized their own services in private homes and then built their own mission church, led by Katharine and Henry Martin of Illabot creek. This story will soon be changed to this address. If neither file connects, please email us. Even More von Pressentin stories will be added over the next few years.